That was the, not so subtle, reminder I needed of my goal to live life with arms wide open, to be in the experience, not outside of it, looking in, a spectator. So that is how it began; how this trip ended up being the most personal one. Just allowing myself to experience each moment, to live in each moment, the good and the not so great, was an amazing (and hard) lesson to learn. Although I have fewer actual photographs this time, than from past trips, my memories are that much richer and the photos I do have are that much more meaningful to me. 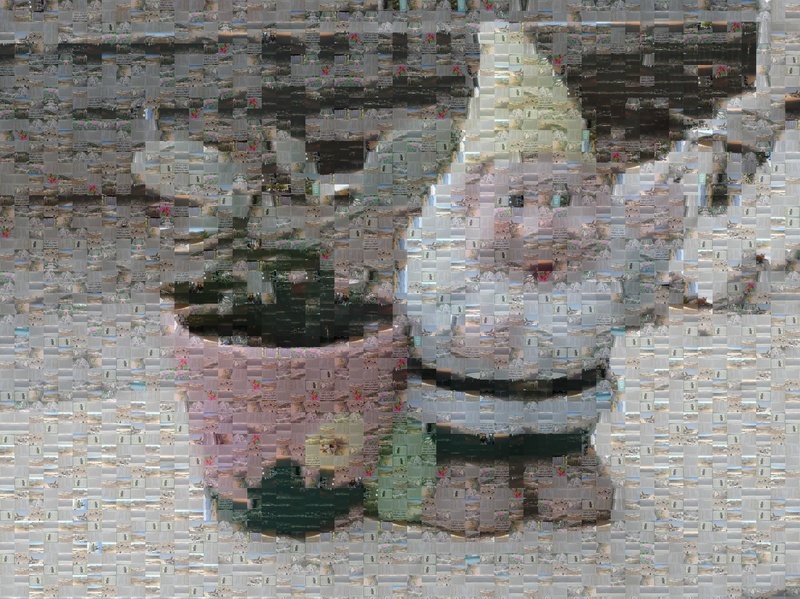 Just as the whole of the mosaic, like our lives, is made up of many different ‘snapshots”, so is the gnome. And like the gnome, we are all made up of snapshots of time. The good, the sad, the joyful and the embarrassing, we all have moments when we are not as compassionate as we hope, or as understanding as we should be, or react as we wish we would. But we are not defined by any one of those moments, those snapshots. We hope the people around us care enough to take the time to understand, and can see past those moments to the whole picture; but they may not. It can be very sad if they don't, and we have to decide whether or not that risk is worth being fully present; or do we choose to be tourists in our own lives – carefully staging each frame for effect. But if the most important thing in life is love, and the heart of love is connecting with others heart to heart, then why do we spend most of our lives running from love . . . hiding from others . . . hiding our souls? Seeking the truth, seeking love, requires that I live authentically . . . Living life with arms wide open though is no easy thing and I often find myself wanting to close my arms, to put them in front, to feel my way along carefully, to protect myself. This last trip was my first conscious effort to let down that guard completely and, to be honest, my hands got slapped pretty hard, and I think I lost a friend. But I’m OK (I live, I love, I learn), there is always hope for tomorrow, and I can never go back to being a tourist. Dancing is not getting up any time painlessly like a speck of dust blown around in the wind. Dancing is when you rise above both worlds, tearing your heart to pieces and giving up your soul. Previously I wrote about the photographs I took while in Palestine last Fall [Five Hundred Ninety Six]. Many of those photos are on the website, but when you view them, you don’t know the whole story – the stories I tell when I personally share those photos. Sure the tags tell you what it is and where it is but you don’t know what was happening or how I felt – what that photo means to me - it's context. So, I have decided that from time to time I will post some here with the “rest of the story”. The photos I am sharing today are from after the olive harvest when I traveled back to Galilee for a few days. The lights of a nearby village – I think Karmiel. The way the land lies, all of the surrounding villages were visible as puddles of lights. It was like fireworks to me. Each light is another life being lived. There was a warm breeze and it was so quiet - I could have sat there for hours. I have this photo next to my bed. When I am stressed I focus on it, and then I am back in that moment. Recently a friend in Jerusalem posted on Facebook that she was looking for something to do that evening. My suggestion was to get out of town and find a quiet hill where she could see the village lights and just BREATHE. So these two pictures weren’t actually taken in Israel or Palestine; but they do represent a memory from my time there. My host made the swan and he gave it to me before I left. He only had a plastic bag to put it in, so I was very relieved that I was able to transport it all the way to Woodland in one piece! I spent a good share of my last night in Eilaboun learning how to make the “paper legos” that make up the swan. Well, after I arrived home, I didn’t have the patience to make a swan myself; but I thought I would try a butterfly. I did not have a pattern, so it ended up deciding to be what, I think, looks like a thunderbird. I was going to make it into a refrigerator magnet as a gift to send to my host, but I never have figured out how to keep pieces from falling apart. This photo was taken overlooking the Bahai Gardens in Haifa. With the soft breeze coming off the sea, it was like a poem. We had just had gelato (mine a yummy chocolate concoction). The thing that stands out for me was the sense of peace – a weight being lifted. I guess had not understood fully, until then, the amount of pressure there is living under military occupation in the West Bank - until I was able to exhale. It is something you can understand rationally, but while there it begins to feel 'normal' - like boiling a frog. The “Incredible Lightness of Being” when that pressure lifted, was intoxicating. These are the ruins of a synagogue in the destroyed village of Bir’am. Bir’ram is the village of Elias Chacour, author of Blood Brothers. I wrote about Bir’am in an earlier blog post. The village is an Israeli park and does not officially acknowledge the Palestinians that made it their home before 1948. The official signs and brochures only speak of a ‘Jewish character” and the synagogue. As I walked along the path, I passed a group of Jewish tourists (they were speaking Hebrew). I had the strongest urge to interrupt and inform them of the REAL history, but I don’t speak Hebrew. I think that if there ever is a 'next time', I won't let that stop me. It was pretty overwhelming – the denial of the reality of what happened there, the destroyed homes and the deafening absence of all the people that belonged there. I went into the synagogue, leaned against the wall and sobbed. A stark contrast to my evening in Haifa. This adorable guy is the great-nephew of my host (I think – I got a little confused on all the family relationships). When we sat down to lunch, he wouldn’t eat any meat because his uncle (my host) doesn’t eat meat - it was obvious how much they adored each other. Although, the not eating meat thing was annoying his grandmother! So much innocence – so many possibilities – for him I have to have hope that he will grow into a world where wishes come true. I guess I hope that for me too! I have been back for four weeks now. It seems each time I go to Israel / Palestine the return gets harder. I still find myself looking at my watch and calculating the the time. That has usually stopped by now. It is strange that I have such an attachment to someplace that was never my home. Each time I go, that attachment grows stronger. I can only imagine what it must be like for my friends that are from there and can only return occasionally (and some not at all). There is also a feeling of guilt that I do have the ability to travel back and forth, returning to a safe and mostly comfortable life. It is like I am only playing around the edges of that reality. I remember someone on my first trip saying that we are just voyeurs. I am starting to believe that this is like one of those ‘life stressors’ when we are told we shouldn’t make big decisions (I know mine recently have not been great). I was speaking with another activist about her experiences of returning home and found that I am not alone in this ‘hyper-emotional’ frame of mind (perhaps it is a form of the "Jerualsem Syndrome" that people talk about - except I don't think I am Jesus). I think it is all that much harder because there are not a lot of us that do this work, and it is easy to feel isolated. I also think it is hard for our friends and family to really understand why we are feeling the way we do. When I was flying back I wrote about crossing the halfway point and that whichever side of that line I was crossing to, I was leaving something precious behind; it really is like being caught between two different realities (like Scotty on Star Trek caught in the transporter beam, unable to materialize in either ‘world’). There is an irony in all this. As much as I talk about how much it matters to the individuals we meet in Palestine (and Israel) that we have come in solidarity (and it really does), I do not hold any illusion that I as an individual impacted them in any way close to how much they have impacted me. I am just one of many ajaneb (foreigner) that they meet in the course of a year; but they are one of a handful of Palestinians and Israelis that I will ever get to know. I wonder sometimes if they know how much I have been changed by them or how I carry the memory of each in my heart. It is possible to be homesick for a place that was never your home. Be present and Take nothing for granted. Messing up is a given; Tomorrow – get up, and try again. Accept love and forgiveness – both are hard to come by, so when you find them, step fully inside. Do both (love and forgive) wastefully – both take courage but don’t be stingy with either. People are amazing creations – full of potential for kindness and cruelty – grow carefully. Humility is the hardest lesson, but the most easily forgotten (Or, just when you feel absolutely sure of something, that is exactly when you should stop and think about it again). Fear creates walls, which create fear, which creates walls, which…..
Hope grows on trees (olive trees)! Leaving is difficult. The last couple days of these trips are always hyper emotional. Like Bilbo Baggins, I feel like butter spread on too much toast. 11:04 a.m.– Wheels Up!– We were delayed for about a half hour – something about Greece. I waved as we passed by Galilee. We are crossingover Great Britain and there is some turbulence Yep – what is the definition of a geek? Someone that (on purpose) turns the very cool in-flight entertainment system to the flight map – that’s me! It is minus 68 Fahrenheit outside the plane and we are at 35,000 feet. The estimated time of arrival is 4:45pm now. Yikes - We are now almost halfway 2930 miles and out overthe ocean proper. Dang it – I am crying again. I know it sounds like I don’twant to go home. But the thing is that once I am there, I’ll be happy to be. It is just that which ever side of this line I am on, I am leaving something precious behind. And I don’t know when or for sure even if I will cross back again. We are just past the tip of Greenland. Just over 1900 miles to go – almost over North America and the temp outside has warmed up to a balmy minus 45. I had to explain to someone once why the plane flies in an arc instead of straight across. I think I have the “all this food” thing figured out. It’s to counter-act all the booze everyone (except me) is drinking. Well I am in Newark now. Wheels down at 4:50 pm my time. By the time I get to Detroit I will have been traveling for about 24 hours and awake for 43. I am already trying to figure out when and how I can go back. I have been home now for about 72 hours. This transition is always surreal. When I arrive to Palestine, that is the surreal place. I can’t believe that I am there. The fact that I am 7,000 miles from home is very strange and I keep checking my watch and calculating the time back home. That lasts a couple of days and then somehow that place becomes ’normal’ for me. Now I am home again, feeling a bit out of place, calculating what time it is there. Then comes the point when reality here pounces on me. I was expecting it – just not so fast and not so hard. Since the Peace Builders Conference I have been contemplating the nature of the Israeli “left” – many activists will say aloud that there is no Israeli Peace Camp. I don’t want to believe that. I have always said that even if they (the left) do not go as far as I would hope – that we need to take them where they are and hope they move forward with time. However, at the conference I was struck by the patronizing tone of the Israelis and it was interesting to see the way the Palestinians behaved in that environment. I have never known a Palestinian to be without something to say, but here, at least in the group discussions, they remained mostly silent. I can’t say that I blame them. The Israeli discourse is very patronizing, laced with things like “We will give”, “We allow”, “We will teach”. I loose my cool and tell one young man – “It is not your place to teach them anything – if they want your help, they will ask for it!!." There are exceptions however. An American Jewish couple doing research seem to have a clear understanding of the reality here. My roommate is a Quaker also and is full of passion. Although an Israeli, she is as anti-zionist as they come. I admire her chutzpah – she is undeterred by the others that strongly disagree with her. There is also a young woman that I did not get enough time to speak with – she spends time working against the eviction of Palestinians from East Jerusalem. But then this morning I see on Facebook that the organization which sponsored the conference is being criticized for publishing an unauthorized Hebrew translation of an Egyptian novel. The author is observing the cultural boycott of Israel and the Director of the organization calls the boycott “immoral”. Again I am struck by the condescension. Boycott is not only a legitimate form of opposition, but it is about the only non-violent one with any impact left to the Palestinians. What tool would the “Peace Camp” suggest the Palestinians use to resist the oppression that they continue to live under? Waiting for Godot has not worked so well. Plans change quickly here. A series of circumstances leave me here another day rather than heading to Tel Aviv. I can not say I am disappointed – this has been a good trip. After lunch with Hanna's sister and her family, we all go to visit Bir'am. What happened in Bir'am ’48 is detailed in the book “Blood Brothers” by Abuna Elias Chacour who lived it. I have been to Lifta – another Arab village destroyed in 1948, but I did not experience the same cascade of emotion there. Perhaps this time was different because I already knew the story well. Perhaps it is because I am here with a family that has been a part of this history – this pain. You can walk among the ruined homes - the only thing left standing is the church (where former residents still return for baptisms and burials). There are also the ruins of a synagogue – testament that once (not so long ago) Arabs and Jews lived here together. I can hear their voices and I can feel their grief – it is overwhelming. Because of this synagogue, this place has been made into a Israeli National Park. The only mention of the Arabs that once lived here are plaques placed by an independent Israeli group, Zochrot. Their mission is to educate an unwilling Israeli public about what happened to these villages in 1948 to make room for the new Israeli State. Hanna points out the hills of Lebanon.I did not realize we were so close. Sometimes things seem so impossible. How do people move from overpowering fear on one side and overwhelming grief on the other to come together? Is it even possible? They have all lost so much – isn’t it time to heal? As the official olive picking program comes to an end, I am left to figure out what to do with myself for a couple of days before returning home. Things just were not coming together for me – missed opportunities,voicemail tag, frustration. A day when my best intentions bear no fruit. An unexpected invitation to come back north. Can I give myself permission for a short holiday before going home? But I am supposed to be doing – right? Oye– mental gymnastics are tiring and I am taking myself way to seriously. So, OK– I head north. As I prepare to go, it is a day full of last minute errands.Was lost in Bethlehem for a shortwhile – called a friend who pointed me in the right direction – just 15 minutes that way (uphill). Now I am back “home” and have 1 hour to pack before the taxi arrives. The driver is an Israeli Palestinian who can move between both worlds. We have to go through the check point and want to avoid any hassles.The driver preps me with my story – I am a tourist with a group from Beer Sheva. We have gone to Herodian and I started to feel ill. The taxi was called to take me to the hotel in Jerusalem. While I worry about being convincing, the driver hangs a Star of David from his mirror and starts to play some Hebrew music. As we approach the checkpoint, we see that the cars ahead of us are searched. The driver puts on sunglasses to cover his most “Arab” feature. As we enter the checkpoint he says “Shalom” to the guard and we are waived through. Don’t these soldiers realize that a game is being played? Or, is that the point – that they get to write the rules of the game? I finally get through the bus terminal with ticket in hand,bags scanned, pick up purse before anyone notices the Arabic book falling out. Quick call to Hanna – I am on my way – on the bus – off we go. I regret that my camera is packed – there is a young (they are all young) female soldier with her M-16 over one shoulder and her Hello Kitty backpack over the other. The radio is playing “Baby it’s all right – it’s gonna be all right now”. About a 2.5 hour ride to near Tiberius. I don’t hear the phone ring (twice). I didn’t realize the bus was about 15 minutes late. Hanna was worried that a bomb had blown up the bus…. This is not a parent’s carefully constructed paranoia, it is not a joke, it is real fear. How do you apologize for that? The next day while Hanna goes to class, I hang out with the mall rats. I am watching the people around me. The only thing that differentiates this from a typical American mall is the Hebrew signs. Well, that and the cursory search of the car as we entered and the more thorough search of my bag as I went into the mall. What happens to a person’s soul with all these constant cues to be afraid? – to surrender your ‘self’, to be less of the human you were put here to be? This is the first time I feel it too. Before, I have felt the fear of accusation, of humiliation, of being the “other”. Aren’t these twin fears,locked in an insane dance? "It is hard to be brave," said Piglet, sniffling slightly, "when you're only a Very Small Animal." On these trips there is always one day where I “hit the wall” and loose hope. I spend the rest of the trip getting that hope back. Our day in Jerusalem was that day for me this time. In the afternoon we went on a tour with the Israeli Committee to Abolish Home Demolitions. This is always a depressing tour, but especially now when peace talks were promised (again). I saw no evidence that there had been any freeze. The settlement situation is definitely worse than when I was here last. Palestinian and Jewish Jerusalemites pay the same in municipal taxes but the difference in return of services is striking. In education there is a shortage of 1500 classrooms for Palestinian children so only 40% of eligible children are able to attend school. And those have to do a split day so they only get a half day of education. I had hoped that the next two days (Friday and Saturday) would bring back some of the hope I had lost – I attended a Peace Builders conference in Beit Jalla. However parts were very frustrating. It has been good in terms of my goal of understanding more about where each of the sub-groups exist in their understanding / beliefs of the occupation. Also,while many on the “Israeli Left” are not quite “there” yet in their understanding of the occupation, I did meet several who are very aware and in solidarity fully with the Palestinians. I have been picking olives for two days now. The ironic thing is that I am pretty sure I am allergic to the trees. I should also mention that the temperature is unseasonably hot. Instead of mid to upper 70’s, we are dealing with 90+ degree heat (today 99 degrees!). It has been tough. On the first day it was also a tough walk / climb over rocky terraces - Quite the lesson in humility.I almost did not go the second day due to spiking a temperature. However, as I was there feeling bad that I was not up to par, I overheard the farmer telling someone how grateful he was just that we were there – he was clearly close to tears. So, it really is not about how many olives we pick, but that we are there with the farmers. I am living with a family in Beit Sahour and as I watch their daily lives unfold I do see differences, but I also see more similarities. The mother eats Corn Flakes for breakfast because she is concerned about her health, the entire family dotes on the newest members (four month old twin girls) and they juggle all the demands of their lives. But, at the end of the day they know that they are still an occupied people. That goes beyond any quantifiable affect (waiting in lines at checkpoints, lack of access to jobs and services), but pervades the mind. It creates a sharp edge to everything here. In the States we are so far removed from this kind of reality, I am not sure how to express it in a way that can be easily understood.Like my host dad has said, they live in a situation that is “complicated”. All I know for sure is that anyone that has refrigerator magnets, can not be so different from me. * Please see the photo Gallery to view pictures from the trip. It has been less than a week since leaving the States. But it feels like much longer – in a good way. The adventure got underway at BenGurion airport. I had prepared so well for the possible scenarios that might play out, only to pass through with no questions at all – and receiving a three month stamp. Then it was off to find the train to the north. Again, I note how insular Israelis appear. Not one person offered to help me board with my bags, nor did anyone move out of the way as Itried to move down the aisle. In fact, they seemed annoyed by me saying “excuse me”. Finally I arrived in Acre (Akko)and met Hanna, whom I would be staying with near Nazareth. He showed me great kindness in his hospitality. In the evening Hanna took me to his mother’s home for dinner. As is the Palestinian way – it was an amazing spread of food. I asked about the spices in the main dish, and, because she did not speak English, mom brought out all the spices for me to smell. I will do my best to recreate it once I get home. The next day we headed for the Mt of Beatitudes and then on to Golan. Our route took us through some very beautiful countryside. If you saw the film “The Syrian Bride” you would recognize one of the stops we made. The Druze remaining in Golan and the Druze of Syria are separated. So to communicate there is an area on the Golan side and one on the Syrian side where family members gather and talk back and forth using megaphones. With the advent of the internet there is less need for this way of communication. Of all the Druze that were in Golan (100,000) only 20,000 in three villages remain. Dinner that night was at a new restaurant which turned out be a nargille (hookah) lounge – a place where women usually do not go. It goes without saying that every eye in the place was on me. I was just glad to not drop any food on myself! The next day we spent in and around Nazareth. One thing I should note about my time in the Galilee is that, as I was living in an Arab village, I would forget that I was in Israel and not the West Bank. But, then Hannah would do something that took me by surprise – like drive into a Jewish settlement. I asked him if he was nervous being there – he replied no “why should I be?”.Yet, it is painfully obvious that the Arab villages are treated differently.The allotment from the state to provide services is half that given to Jewish areas. This means that trash pick up, sidewalks and roads maintenance and other services are below par. Wednesday I traveled to Beit Sahour. I took a bus trip that took about three hours to Jerusalem (J-Lem). I was glad to have gotten on at an early stop because the bus ended up being very full (mostly soldiers moving around). I wondered if a soldier came to sit next to me, how I would say “no guns please”. Luckily a young girl without a gun (that I know of) sat down with me. After arriving to J-lem, I gathered my things together and left the bus station. After getting out I realized I did not have my water bottle with me. I was really scolding myself about losing it when I saw security forces scrambling around the station. The one near me, at one moment was standing calmly watching the pedestrians, then was all of a sudden sprinting into the station. The next thing I know two security forces approach me and one starts asking me about my water bottle. I pretended to not realize that “anything” had happened and told them that yes, I had lost my bottle – did they find it? Oh –thank you so much! It took awhile after that before the bottle came back to me, but it did (without the water) – international incident averted. I did notice a couple “critical” glances from some of the security, and may have heard something like “stupid American”. Oye Vey! I am now safely settled in with my host family, planning what to do with myself the next couple of days. Saturday I plan to be at the Paidia Center, learning more about their work. (paidia.org). I begin Arabic lessons tonight.